CONCRETE FOUNTAINS - Which Concrete Fountain Design Should You Choose? 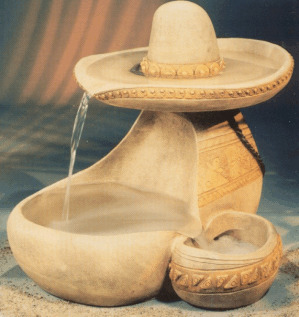 Concrete fountains come in many different designs and sizes. Adding a concrete water fountain to your garden can really make a statement and give your garden a focal point to build around. But how do you choose among the many concrete garden fountains out there? If you already have a theme in mind this will help. If your garden doesn't have a specific theme, then maybe just a simple tiered fountain will work. Whether it's large or small, decorative or plain, a concrete water fountain will add a distinctly impressive, and personal air to any outdoor garden area. The size of your garden area should dictate the size of your cement fountain. Having a water fountain too large or too small would create an unbalanced look to your garden. After you've chosen the right size you can decide on a theme. Do you like animals, birds, flowers, or multi-tiered fountains? Do you want something with flair or something simple? Do you want something funny or something risky? Answering these questions will help you decide among the many concrete garden fountains to choose from. Are you looking for an indoor concrete fountain? 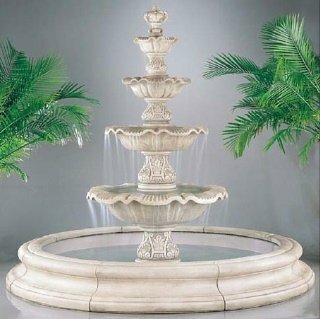 Indoor fountains, both floor standing and tabletop, come in all sorts of attractive designs similar to outdoor fountains. The soothing sound of an indoor water fountain will provide the relaxation and de-stressing you need as well as add a beautiful accent to any room. You can put one on your desk at work and enjoy the calming effect during the day. Then when you come home you can sit by the garden and enjoy your concrete garden fountain. Installing a concrete water fountain in the garden will give it a more pleasant ambiance and add a new dimension to your garden. It lends character to an otherwise simple appearance. Gardens are a place to relax and rejuvenate. It is a place where you can withdraw from the stresses of a hectic day for quiet contemplation. Therefore, it is a good idea to choose a water fountain that will improve the appearance of your garden. Keep in mind when choosing a concrete water fountain, you will need a power supply to run the water pump. Careful thought and some pre-planning should be taken about where you are going to place the fountain and how you are going to run power to it. Check out CONCRETE BENCHES to see all the different styles available.